I wish I could say I thought of this theme on my own, but when someone else mentioned using it on Storytime Underground I knew right away it was one I could have a lot of fun with and would be perfect for my group that it often very wiggly and talkative. This is not a quiet storytime; rather than fighting the kids' natural inclination to move around and be loud, it embraces it! As always, we started with our welcome song, and I introduced the topic, talking about what sounds lions, tigers, and bears make. For the purposes of our storytime today, we agreed that lions would roar, tigers would growl, and bears would snore. After the introduction, we sang our story song and started with our first book, Roar! 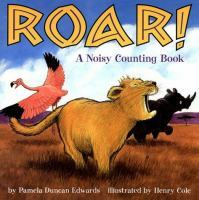 - A Noisy Counting Book by Pamela Duncan Edwards, illustrated by Henry Cole. In this story, a bored lion cub is looking for someone to play with, and can't understand why everyone runs away when he roars an invitation. This story emphasizes the word "roar" throughout, and kids love roaring, so I made a little "Roar!" sign to hold up each time so the kids would know when to roar. I also like that the story also gives the opportunity to work on counting, number recognition, and colors, besides being a lot of fun. Eventually, the lion cub does find appropriate playmates. Next, we sang a simple song incorporating the sounds of the three animals we were talking about today, but of course you could add as many verses and as many animals as you'd like. I had some "animal-on-a-stick" props to hold up to show which animal we were doing each time. "You Can Hear Lions Roaring"
You can hear the lions roaring in the jungle, "Roar, Roar"
After that, we had an even more fun story, It's A Tiger! by David LaRochelle, illustrated by Jeremy Tankard. This book requires a departure from the usual "criss-cross applesauce, hands in your lap" and instead should have the audience standing up so they can act out parts of the story. In the story we are walking through the jungle, and repeatedly stumble across a hidden tiger and must run, climb, and swim to escape him. 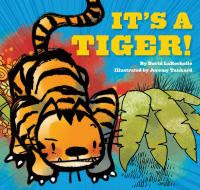 The kids will catch on quickly and look for the clue to the hidden tiger, and love yelling out, "It's a tiger!" 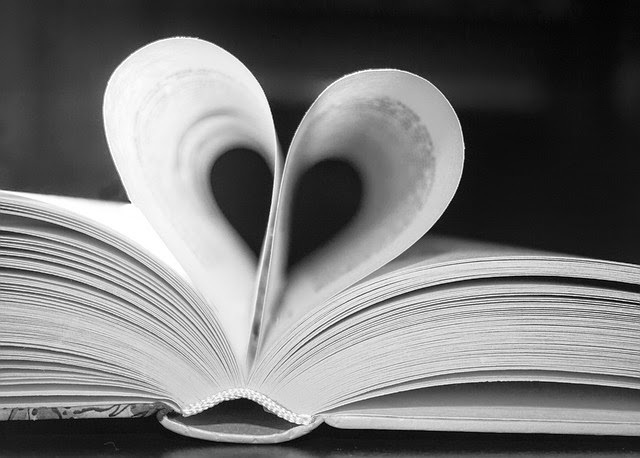 when the page is turned. There is also a funny twist at the end. I LOVE this book! We were ready to rest after all the activity with It's A Tiger!, so I had them sit back down, criss-cross, to do the call-and-response chant, "Going On A Bear Hunt". First I showed them how to clap in rhythm, and explained they were to repeat everything I said. And a little fuzzy tail. Full of very tall grass. We'll have to go through it. Full of wet, sticky mud. We'll have to swim through it. We'll have to climb over it. We'll have to go inside it. I feel something, it's big and furry. With two round ears, and a little fuzzy tail! With a cold, wet nose, and big, sharp teeth! 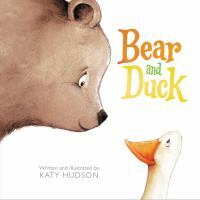 They had done such a good job participating, I decided to go ahead and do the third book, Bear and Duck by Katy Hudson. I also felt like I owed it to the teachers to end with a quieter book to calm the kids back down before I left. In this story, Bear decides he is tired of being a bear (having to sleep all winter, having hot fur, and getting stung by bees) and wants to try being a duck, which doesn't quite work out as he'd hoped. But in the end, he learns to accept and appreciate being a bear, and makes a new friend. I have to say, this was one of the most fun storytimes I've had in a while. Lots of participation and movement, so works great with those kids that are hard to keep engaged. They really liked all the books, but they LOVED It's A Tiger!, and so did I. If you have not ever done this book in storytime, you should! I was a little surprised that their little eagle eyes started picking out the tiger's tail right away, and even at the end a couple of them saw the crocodile tail and knew what it was. I was also pleasantly surprised at how many of them recognized the printed numbers in Roar!, and of course they loved roaring. They didn't seem to have much interest in the first song, other than making the sounds, but they really got into "Going On A Bear Hunt". It helped that one of the kids had the book at home and knew how it went, so he took charge and led the kids in repeating each line after me. I think I did one verse too many for this age, as I noticed I was losing participation towards the end, but I got them all back when we ran into the bear and had to race back through all the obstacles to get back home safe and sound! So, to sum it up, 16 kids and I had a lot of fun this morning! Oh, and as a bonus, watch this video of a real life bonded lion, tiger, and bear trio that were rescued as cubs. Of course their names are Leo, Shere Khan, and Baloo. *Sadly, Leo the lion died just 4 months after I originally posted this due to liver cancer, after spending 16 years with his brothers.